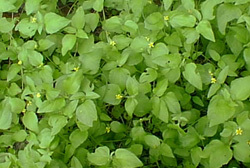 HABIT: Ever blooming tiny yellow flowers. Very easy to grow in any soil. Evergreen in the southern half of the state. Freezes to the ground in the northern areas but returns each spring. CULTURE: Drought tolerant and pest free. USES: Natural ground cover. Should be used more. Looks terrific when planted with wild violets. PROBLEMS: Some people still consider it a weed – that’s too bad. I planted horseherb like you suggested and it was doing great, last week put corn gluton meal on it to fertilize and now it is all almost dead, was it wrong to put it on, I thought it was a fertilizer?? Although this native groundcover has very low fertility requirements, corn gluten meal shouldn't hurt it unless overused. On the other hand, you may have come up with a new broadleaf herbicide. HABIT: White, pink, rose, yellow, or red flowers. Finely textured, succulent groundcover. Easily damaged by foot traffic or pets when the succulent leaves and stems are crushed. Native to Europe and Asia. Sedum ‘Autumn Joy’ is a tall growing perennial with dramatic flowers that are white as they start developing in the summer and end up red in the fall. S. ‘Ruby Glow’ is lower growing and blooms all summer. CULTURE: Easy, any soil, prefers well-prepared and drained beds. Best exposure is partial shade. 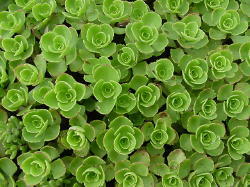 USES: Groundcover for small areas, Oriental gardens, rock gardens, stone walls and small accent areas. PROBLEMS: Damage from foot traffic.